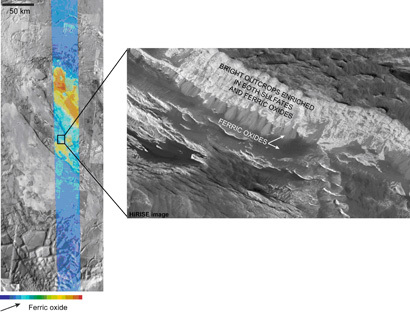 Observations made with the OMEGA imaging spectrometer onboard Mars Express reveal very strong signatures of sulfates and ferric oxides in Aram Chaos. Detailed morphological analyses indicate that the concentration of ferric oxides in this region results from the alteration of a sulfate rich sedimentary formation resting on the floor of the crater. These results are reported by M. Massé and colleagues in the 9 December 2008 issue of the Journal of Geophysical Research. Aram Chaos is a 280 km crater located northeast of Valles Marineris. This depression is connected to the Ares Vallis outflow channel by a 15 km wide and 2.5 km deep gorge cutting though the eastern wall of the crater. Morphological map of Aram Chaos. In order to decipher the geological history of this area, Massé and colleagues compared the mineralogical data provided by OMEGA with high spatial resolution imagery from a number of Mars orbiters. OMEGA observations are acquired with three detectors: Visible Near Infrared (VNIR, 0.38 to 1.05 μm), Short-Wavelength Infrared (SWIR, 0.93-2.73 μm) and Long-Wavelength Infrared (LWIR, 2.55 to 5.2 μm). Images are obtained at a spatial resolution ranging from 300 m to 4 km per pixel. For the study reported here the team restricted their analysis to the spectral domain between 0.4 and 2.6 μm. In a systematic survey of ferric oxide signatures on Mars, Aram Chaos exhibited the strongest signature. An in-depth analysis of the spectra for this region revealed regions with mineralogical compositions consistent with ferric oxides and with a mix of ferric oxides and sulfates. Correlation of the spectral signatures with high resolution images allowed Massé and colleagues to infer a formation scenario for the Aram Chaos crater in which the depression seems to have been filled by two sequences of sediments. The older sediment corresponds to chaotic terrains whose mineralogical composition cannot be ascertained since the region is covered by dust. The younger one corresponds to a dome-shaped, 900 m thick, layered sedimentary formation emplaced later on the chaotic terrains. The bulk of this formation is composed of one single bright material containing both sulfates and ferric oxides. 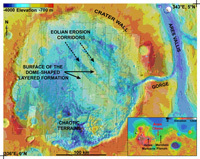 After its emplacement, this dome-shaped formation has been grooved by large eolian corridors. In these corridors, eolian removal of the bright material has left local accumulations, in the form of dark sand sheets and dunes of residual grains enriched in ferric oxides. The processes involved in this deposition are most probably very similar to the ones observed by the Opportunity rover in Meridiani Planum suggesting a common geological development process for both regions, and a possible role of water in the past.